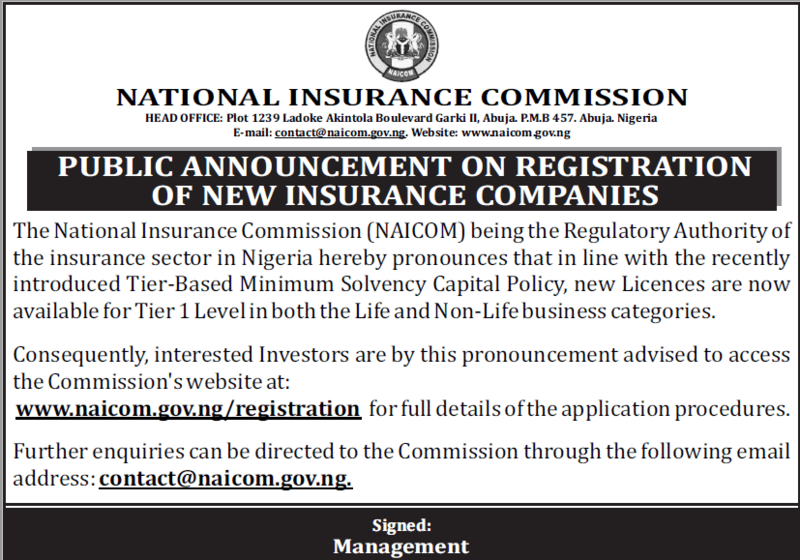 The National Insurance Commission (NAICOM) is planning to publish the names of insurance firms and their categories next month, The Nation has learnt. The publication will show the firms that will operate as Tier 1, Tier 2 and Tier 3 under the new Tier-Based Minimum Solvency Capital (TBMSC) Policy. The TBMSC billed to take off on January 1, 2019 would lead to the recapitalisation and recategorisation of the 57 existing insurance firms. It was also learnt that the NAICOM has issued letters of advice intimating each firm on the “Solvency Assessment Status”of the companies as at December 31, 2017. The insurers were assessed based on approved audited accounts for the year ended December 31, 2017. The firms that wish to be categorised based on their half year 2018 accounts may submit an audited copy to the Commission to meet the next financial year, which begins January 1, 2019. The policy, which was unveiled on July 25, has since sent shockwaves across the industry. But the Commission seems to be worried over this development. A source, who asked not to be identified, told The Nation that the operators did not shore-up their capital after the last recapitalisation in 2007. He said many of the firms struggled to meet the minimum requirement of N2 billion for life business, N3 billion for general and N5 billion for composite in 2007, saying that many refused to boost their capital after the recapitalisation. He cited the banking sector 2005 recapitalisation when banks were made to increase their minimum capital to N25 billion, stating that the banks have continued to increase their capital and none of them has less than 50 billion capital base as at date. He said: “Our operators seem to be too docile. In 2007 the majority of them in operation struggled to meet the minimum requirement. Some waited till the last minute to recapitalise and in the process, some were bought cheaply. “If you look at the banks that were made to recapitalise by the Central Bank of Nigeria in 2005, they have continued to increase their capital base by themselves and today, none of them has less than N50 billion capital. So, if the CBN asks them to recapitalise, they will comfortably do so. In the case of insurance, we have been talking to them about Risk-Based Supervison (RBS) and the need for them to increase their capital to meet their primary obligation of paying claims, among otherss, since the tenure of the former Commissioner of Insurance, Fola Daniel. “But they refused to act and so the Commission decided to take steps to make them increase their capital or underwrite only the risk they have capacity to carry. They are all aware that RBS means simply that you can’t carry some risks like oil and gas, aviation and marine among others, if you don’t have the required capital to do so. So, there is no need for them to panic because the Commission is not forcing any of the companies to inject capital,” he added. The Chairman, Mutual Benefits Assurance Plc, Dr. Akin Ogunbiyi, however said that efforts by NAICOM to reposition the industry through the RBS and TBMSC could be counter-productive, anti-growth and disruptive, stating that the immediate implementation of the Tier- based rating of firm could lead to crisis of confidence in the entire industry with only about seven of the 29 firms qualifying under the new standard. He said it would also lead to de-listing of insurance stocks from the stock market. He said insurance stocks were already classified as penny stocks due to their inability to support pricing by regular dividend payments, adding that there would be hostile take-overs of the firms for peanuts, especially by foreign investors with short-term gains as focus.